You are here: Home » MEDIA » Books » Seeing Science: An Illustrated Guide To The Wonders Of The Universe by Iris Gottlieb (book review). 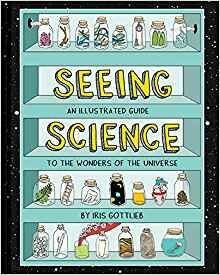 Seeing Science: An Illustrated Guide To The Wonders Of The Universe by Iris Gottlieb (book review). My first thoughts when I opened Iris Gottlieb’s book, ‘Seeing Science: An Illustrated Guide To The Wonders Of The Universe’ is that it was primarily for a junior audience. Nothing wrong with that. We often review books that might be useful for your sprogs. However, I would also include anyone who needs the concepts of science explained simply so they can get a grasp of them. The book is divided into three sections: Life Science, Earth Science and Physical Science. All of this is with suitable examples and a few funny ones to see if you’re paying attention. Don’t treat this book as comprehensive but I think you’ll find a lot of the information will stick in your heads afterwards. Occasionally, some statistics will rear their head. I think the best one is of how many atoms and cells in the human body and it’s rather reassuring we still out-number the quantity of bacteria. If you want to believe in reincarnation, become a naked mole rat as they have everything going for them but appearance. An odd thing that struck me about the comparison between which is more, the grains of sand or stars only applies to the former coming from Earth. If you included the number of sand particles in the entire cosmos, then it would win out. About the only thing I was surprised by was the discovery of what caused the sliding rocks in Death Valley move had finally been found out. It’s a shame that Newton’s first two motion laws aren’t covered. It’s not as though some pages covered too little a detail. Even String Theory is covered although I’m not sure how long that will last now. Don’t treat this book as being perfect but if you want a quick grounding on various sciences, then it does what it says in the title. « Doctor Who: Series 11 (or 36 depending on how you count): Episode 4: Arachnids In The UK by Chris Chibnall.